Simpsons World the Ultimate Episode Guide: Seasons 1-20 is a 1200 page book that covers the first twenty seasons of The Simpsons, from "Simpsons Roasting on an Open Fire" to "Coming to Homerica". It was released on October 26, 2010. "Look what you get in this cromulent compendium! Comprehensive episode synopses for 20 seasons of Simpsons, including 128 new gut-busting episodes never before covered! Stuff you may have missed! More screen shots than ever before! Over four hundred character profiles! Every chalkboard phrase Bart has ever written! Nifty new art throughout! Quotes and quips from all your favorite characters! Two or more jam-packed pages devoted to every episode! A complete filmography of "Itchy & Scratchy"
And much, much more . 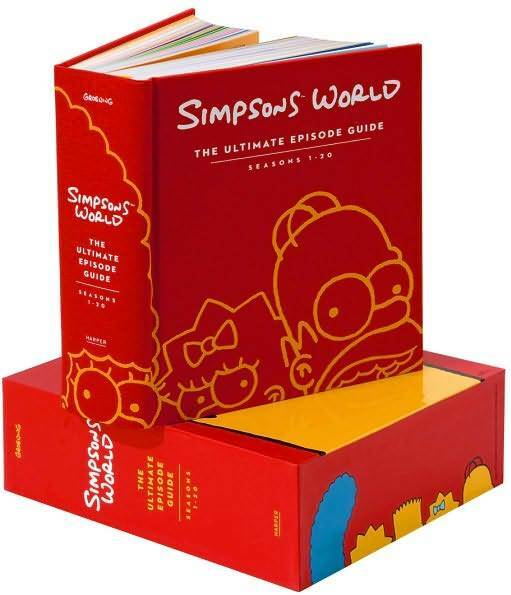 . . Packaged in the ultimate wraparound slipcase and weighing in at a hefty 8.8 pounds, Simpsons World The Ultimate Episode Guide (Seasons 1-20) is meant for reading, not throwing!" There are factfiles on nearly every episode page, the exceptions being non-canon anthology episodes with three parts, i.e. Treehouse of Horror series episodes. These factfiles are usually characters, although they have also been objects or locations. Modified on August 31, 2013, at 10:41.